"I am the Terror that flaps in the night, I am the raspberry seed you can't floss out. I AM DARKWING DUCK!" Dude, how could anyone not love lines like that? I absolutely treasured this show back when it first came on the air in the early nineties. Yes, I was in high school at that time, but I didn't care. The show was damn funny, had some great writing, had interesting and well-voiced characters, and delightful stories. At least, that's how I remembered it... I hadn't actually seen it since the original run. So I was both excited and hesitant when I learned about the show was being released on DVD. Would it be as good as I remembered, or would I be in for a world of disappointment? You don't even know how happy I was to discover that the episodes are as enjoyable now as they were back then. As with any series, there are going to be some episodes which are better than others, but most of the ones here live up to the high standard of the series. 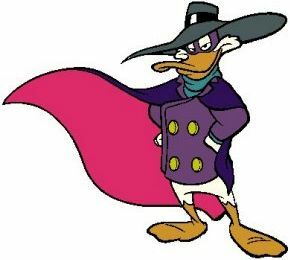 For those of you that don't know Darkwing Duck is a humanoid duck crimefighter that wears a dark purple and black costume and uses a non-lethal gas-gun as his primary crime-fighting weapon. The character, and his alter ego Drake Mallard, is expertly voiced by one of the biggest names in voice-overs, Jim Cummings. Launchpad McQuack, whom some of you may remember as Scrooge McDuck's pilot from DuckTales, becomes Darkwing's friend and sidekick in the first episode, which works out good because he's pretty handy with fixing equipment that always ends up getting busted... somehow. He also pilots Darkwing's duckbill-shaped jet, the Thunder Quack. He's naive, but has a big heart. Filling out Darkwing's little family is Gosalyn Mallard, Darkwing's adopted daughter... or more technically, Drake Mallard's adopted daughter. She can be a handful at times, often attempting to "help out" Darkwing in his crimefighting. Of course, what would a crimefighting duck be without any villains? Luckily, the city of St. Canard is full of strange and dastardly bad guys, such as the living-plant guy Bushroot, the electrically-obsessed Megavolt (my personal favorite), the James Bond-like villain Steelbeak, Darkwing's love interest Morgana Macawber, and his alternate universe twin NegaDuck. Each and every one, along with all the ones I didn't mention, are unique in their personalities and their intentions, which really helps to keep the show from getting stale. Most episodes deal with Darkwing and Launchpad trying to solve a mystery of crimes, which lead them to some strange bad guy with weird abilities. 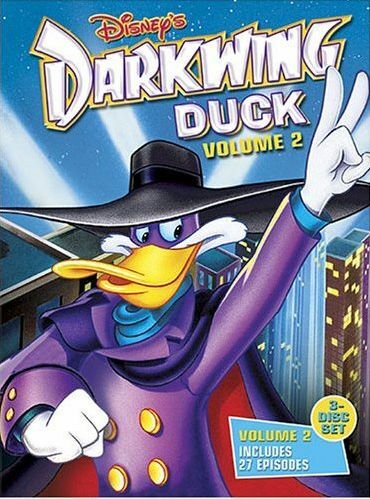 Some episode parody parts of other movies, such as the one titled "The Secret Origins of Darkwing Duck" which parodies the Superman origin story (and tells a false origin of Darkwing Duck, by the way). Then other episodes have Darkwing going into alternate universes, such as in "Life, the Negaverse, and Everything" where he goes to NegaDuck's dimension, and "Whiffle While You Work" where he goes into a videogame. The first DVD box set was released on August 29, 2006, and the second box set will be available on August 7, 2007. Both sets include 27 episodes, making for a total of 54 episodes, which isn't even the entire first season! I would definitely recommend this series to anyone, as it works good for both kids and adults. My only real gripe is that there isn't really any special features. But that's kind of expected, and each set is packed with 27 episodes, so it's no real loss.